HONOLULU — Hawaii may be thought of more as the land of surf and sand but football is also a big part of the culture and the state has churned out some pretty incredible players. After the College Football Playoff national championship game, fans are adding another name to the list: Tua Tagovailoa. The Hawaii native and freshman Alabama quarterback came off the bench in the second half of Monday night’s game to lead the Crimson Tide to a 26-23 overtime win over Georgia. In turn, Hawaii fans roared to life, taking to social media as local news outlets sent mobile alerts about one of the biggest touchdown passes in the history of Alabama — and Hawaii — football. “It was surreal, it was so unexpected because we pretty much thought Alabama lost,” said Honolulu resident Brandon Lee, who was driving home when friends started texting him to let him know that Tagovailoa was in the game. Lee raced to a friend’s house to watch and saw the entire second half, including Tagovailoa’s game-winning 41-yard touchdown pass to DeVonta Smith. “I think that’s one of the unique qualities about Hawaii, is that whenever you see a local person shine, on a national stage especially, we all have this certain pride that we feel and especially when they do it with humility and class like he did last night,” Lee said. 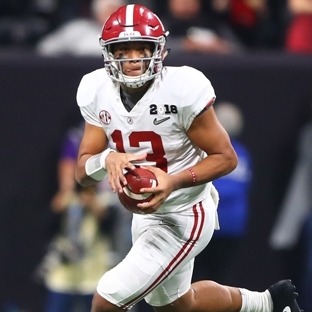 Tagovailoa entered the game at halftime, replacing a struggling Jalen Hurts, and threw three touchdown passes to give the Crimson Tide its fifth national championship since 2009 under coach Nick Saban. Before the game-winner, Tagovailoa took a terrible sack, losing 16 yards. On the next play, he found Smith, another freshman, and hit him in stride. Heisman Trophy winner and current Tennessee Titans quarterback Marcus Mariota, who went to the same all-boys Catholic school in Honolulu as Tagovailoa, took note of the young QB on Tuesday. “It’s nice to see this next generation of kids kind of coming up and representing Hawaii well,” Mariota said. Passas told The Associated Press in a telephone interview that Tagovailoa began attending the football camp at Saint Louis when he was just 9 years old and immediately started throwing with the senior players, including Mariota. The coach said that nothing is ever too big for the player he and his Saint Louis School players called Reverend Tagovailoa because he would recite passages from the Bible and relate them to their situation on the field. Glenn Medeiros, Saint Louis School president, said he was at a function when Tagovailoa came into the game. This article was written by Caleb Jones from The Associated Press and was legally licensed through the NewsCred publisher network. Please direct all licensing questions to legal@newscred.com.